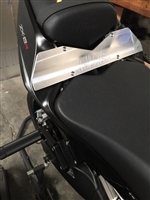 This is a longer and wider puck holder for the NDC subframe at 3/4 inches further off the back of the bike and 3 1/2 inches wide. Note: This only work on the 09-19 ZX6R subframe. Copyright © 2013 NDCustomz. All Rights Reserved.